Ignore the fact that I am a little tired and have no idea what I am saying in this post, kay? I have actually mentioned the group E-girls on this blog once or twice before, however I have yet to review anything by them, be it a PV or a single. I decided at some point during the past two weeks prior to this post that I certainly wanted to review this song; it's quite recent, but it's also a song that many of us will know well, a nice little blast from the past if anything. I am sure by now that you all know what The NeverEnding Story is, whether it is the book or the film, and I hope beyond all hope that you know what the song sounds like at least. If not, then I think that the E-girls' own rendition will help you in learning more about this glorious song and possibly peak your interest into venturing into the film itself, who knows? 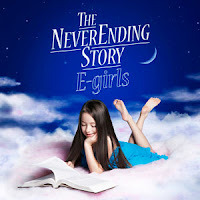 So, let's take a look at E-girls' cover of The NeverEnding Story! I hope you enjoy! When I saw the short music video for this song on Aramatheydidn't, I immediately thought to myself 'have E-girls named a song after that film and song of the same name...', and of course my interest was peaked at that very moment. I took a look at the short PV and realised quickly that this was actually a cover and not a random song with the very same name, and honestly, I think that I fell in love with E-girls a little more... well, my interest in them peaked greatly. The NeverEnding Story is, like many others alike, a part of my childhood. I have heard this song in various forms too, but one of my earlier memories concerning this song and film would be when I was extremely young. I only remember vague parts of the film because it was so long ago, but hearing this song instantly brings me back to my childhood where I sat with my father, younger sister and one of my brothers as we watched the film. Even though I have few memories of the film itself, the song itself brings back a lot of nostalgia and just takes me back to my childhood when I watched this film, and it's nice to be able to look back at that. 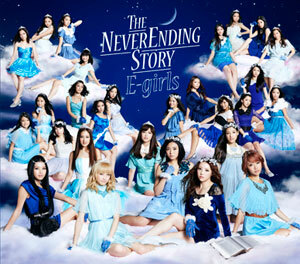 The song performed by E-girls is a Japanese rendition, but it is done very well. There is a slight difference in the instrumental... okay, a vast difference, but it suits the rhythm of E-girls and fits with their group dynamic perfectly in my opinion. E-girls have quite an electro feel to them, but this song isn't overly synthesised or auto-tuned like Just in Love is in some parts, and I am thankful that whilst they were reconstructing the instrumental, they did not overdo the electro parts at all. It still sounds as gentle as I remember (from the few reconstructions I have heard plus the original) and I really feel that E-girls did this song justice and made it sound wonderful. I love the song itself, but I feel like E-girls have made me love and appreciate The NeverEnding Story more. Maybe it's because it's a mix of the Japanese music that I love now and nostalgia, or maybe it's just pure love for the song itself that allows me to love it more. Either way, I feel like E-girls have allowed me to enjoy it more and go back a little. Hearing this song again also makes me want to look at the film and watch it once again, maybe with my family or on my own. I like the E-girls rendition; it's modern, but it doesn't hurt the original in any way. f anything, it makes it sound just as beautiful. It's sung beautifully and the arrangement sounds great and just makes me want to take a trip down memory lane and re-watch The NeverEnding Story movie with my dad. JUST IN LOVE is an original song by E-girls and the first song that really caught my attention from this group. I actually heard this song through a short PV that I had enjoyed thanks to the abundance of colour and creativity in the video. This song was actually a digital single at first, however it was released as a B-side to The NeverEnding Story because... well, it's just awesome. Or at least it is to me. The song is energetic and extremely catchy, and whenever I listen to it I feel really happy and energetic. It's such a fun tune, one that sounds as colourful as its video counterpart. I enjoy singing along to the parts that I can sing along to, and shimmying around to the parts that I can't sing along to... either way, I am enjoying this song a whole lot. It's so vibrant and energetic, and I love that it can make me feel so happy and energetic at the same time. As a song, JUST IN LOVE is just as enjoyable and fun as the PV is in my opinion. It's an upbeat, well-paced song that is so addictive and good! It's a nice contrast to The NeverEnding Story as well, something I do like when it comes to A-sides and B-sides, and sounds extremely cheerful and friendly. The girls all sound amazing in it and I feel like E-girls really delivered a strong, amazing performance with this song, one that won me over immediately after viewing the short PV for the first time. I'm really happy that I was able to gain an interest for E-girls through this song, because it's wonderful; it introduced me to a pretty awesome group in my opinion. Before I prattle on with more praise, I do want to highlight the fact that there is a lot of electro effects in this song on the voices, something which I have, over-time, come to enjoy in songs when done correctly. Thankfully it's done pretty well in JUST IN LOVE, though i my opinion the opening line is a bit too heavily tuned, but that's a personal opinion entirely. Other than that, I actually really enjoyed the electro effects in the song; it added a fun element to JUST IN LOVE and made it all the more enjoyable for me as a listener. Then again, any group that isn't a Hello! Project unit tends to have decent to awesome auto-tuning and electro sounds. 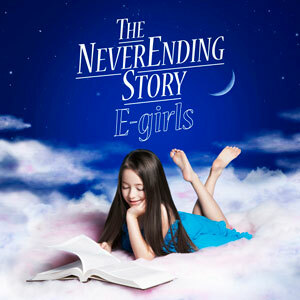 The final track on this single is an English cover of The NeverEnding Story by the E-girls. I was actually surprised to see the English cover on the track list, but I think that adding it in there just shows that the girls are working hard by singing in English as well as sticking true to the song in a way. Of course the instrumental is the same as the Japanese cover, however I like the modern feel to it still. I do think that it would have been quite cool for the girls to have actually sung the original English lyrics with the original instrumental, though. It would have been a nice bit of nostalgia for fans of the movie who were buying the single, but oh well, I'm happy that they covered the song in both English and Japanese; it's nice. There really is not much I can say about the song itself other than that I think that the girls did a good job with singing in English and that I think they sound fabulous; E-girls are amazing together, and I like how they fit each other perfectly when it comes to singing. They sound so gentle and heavenly, almost, which is probably why The NeverEnding Story sounds so good when they sing it. Their voices are just so perfect for a song as pure and gentle as this, and their own voices match the song beautifully and just enhance that magical sound that The NeverEnding Story has behind that instrumental. Again, not much I can say, but I enjoy this song just as much as the Japanese cover the girls did. This is a nice treat in the single if anything though, and shows how hard the girls worked to sing in English. Overall I have really enjoyed this single. 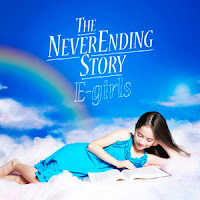 The NeverEnding Story covered by the E-girls is a beautiful tune, on which sounds very pure, gentle and almost heavenly thanks to the voices of the girls used here. A classic song has been given a nice modern twist, one which is quite powerful but still holds onto that magical and nostalgic feeling that the original song has. I love how modern it sounds and I love that it was sung by a group; it sounds so lovely with everyone's voices coming together and I really think that E-girls made an amazing cover. The single itself is good; you have two great songs that are nice contrasts to each other and make you feel happy when you listen to them. It helps that they are both extremely catchy and fun to listen to as well, though that's what I think... check them out and see what you guys like about this single. I highly recommend E-Girls, which is actually the girl groups under LDH (Dream, Happiness, Flower & Bunny) mixed together. It is set up kinda like EXILE where most of the girls are just dancers but a few are vocalists. Follow Me is another good song from them and I like Celebration too. I got into the group because two of the members are sisters of a Kansai Junior, Fujii Ryusei. I have the girls listed in the relatives in showbiz post (http://never-ending-music-power.blogspot.com/2012/04/relatives-in-showbiz.html) I did about a year ago if you want to see which ones. Honestly all three siblings are gorgeous. Thanks, I am just trying to get into them but so far, I like the group itself; though sooo many girls! I've got into E-girls quite recently and I must say they're all really talented. My favourite A-side is One Two Three. My favourite B-side is Suki desu ka? from Follow Me single. The majority of their fans are young girls but recently they say that there are more male fans coming to their live event, and it looks pretty balanced. I have yet to listen to everything they have done, but I do think that I have heard One Two Three... I may need to re-listen to remember it, though! And it's great that they are getting more balance in fans, but having female fans is great too! I do agree that it seems that the E-girls' fanbase overseas is a little low; I actually haven't really found anyone who is a very big fan of them. Currently, I am a casual fan, but I hope to follow them a bit more, because they are really wonderful and, as you said, talented.